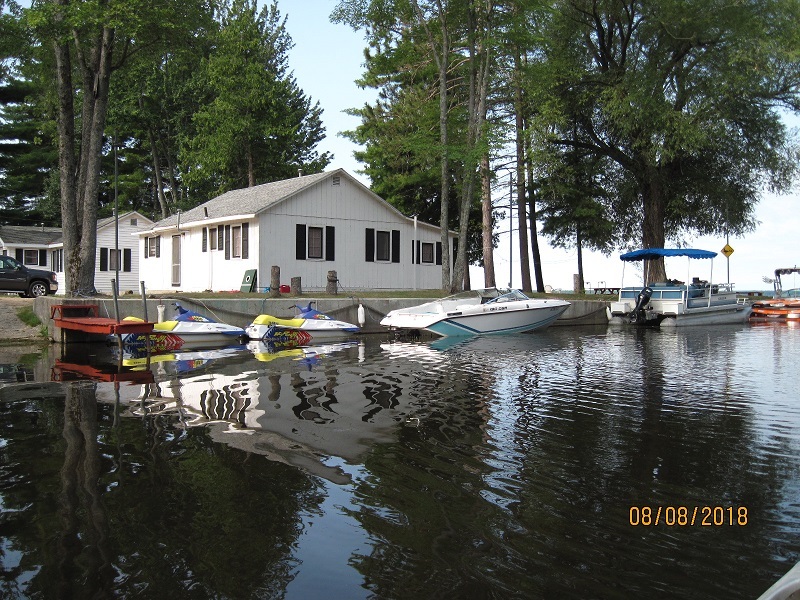 The place for boating, fishing, relaxing & touring. 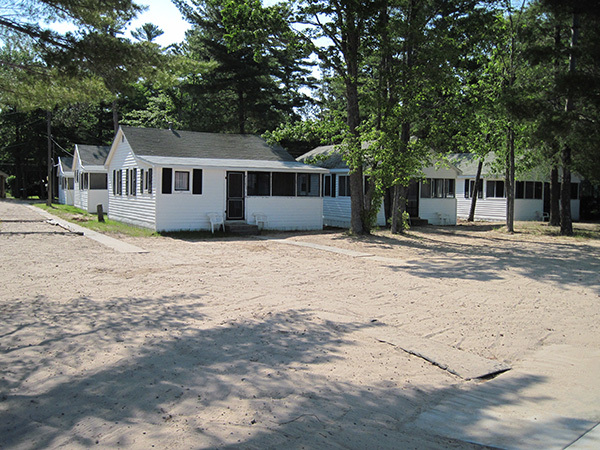 Cottages 1, 2, 3, 4 & 7 have three bedrooms for up to 6 people. 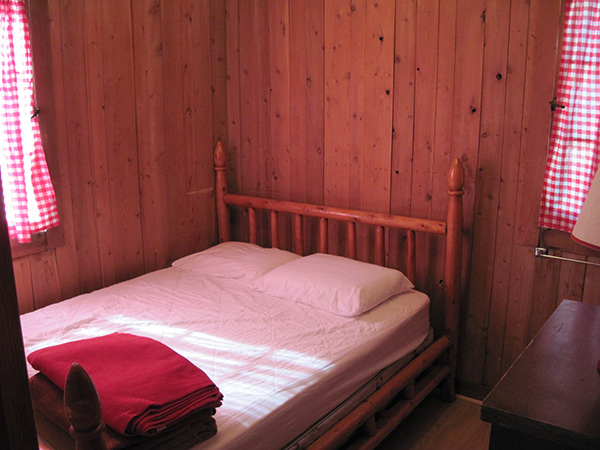 Cottages 5 & 6 have two bedrooms for up to 4 people. 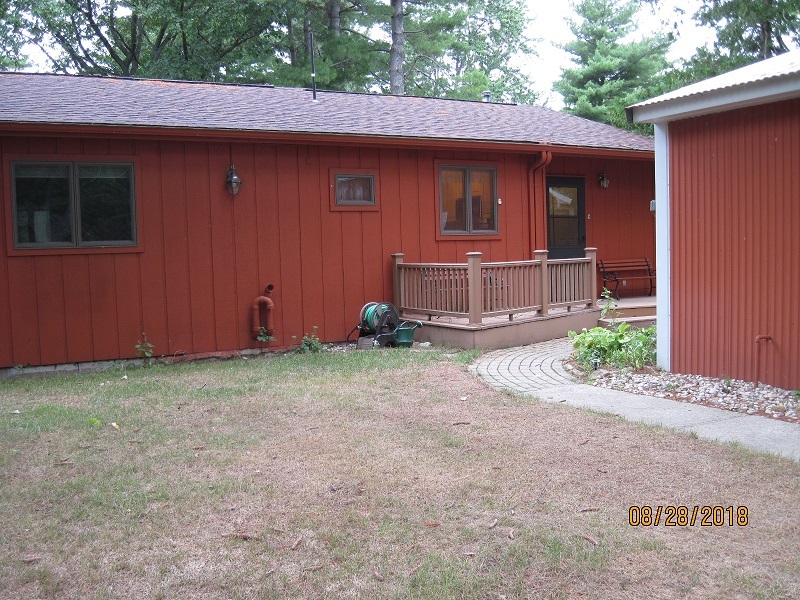 Memorial Day through Labor Day, $575 - $625 per week, Saturday to Saturday. 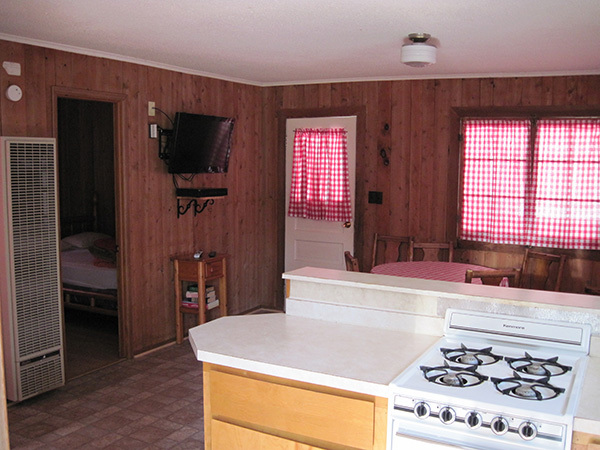 All cottages have fully equipped kitchens with microwaves, crock pots, and all necessary utensils. There is also satellite HDTV in every unit in the event the weather isn't cooperating. 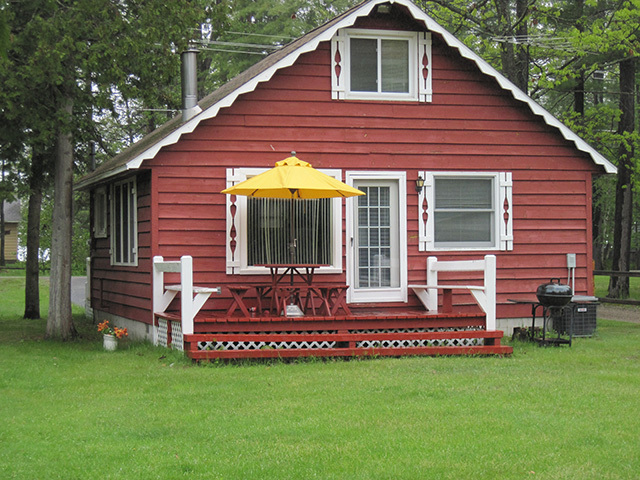 The rustic and comfortable accommodations create a relaxing atmosphere with beautiful views of the lake and surroundings. 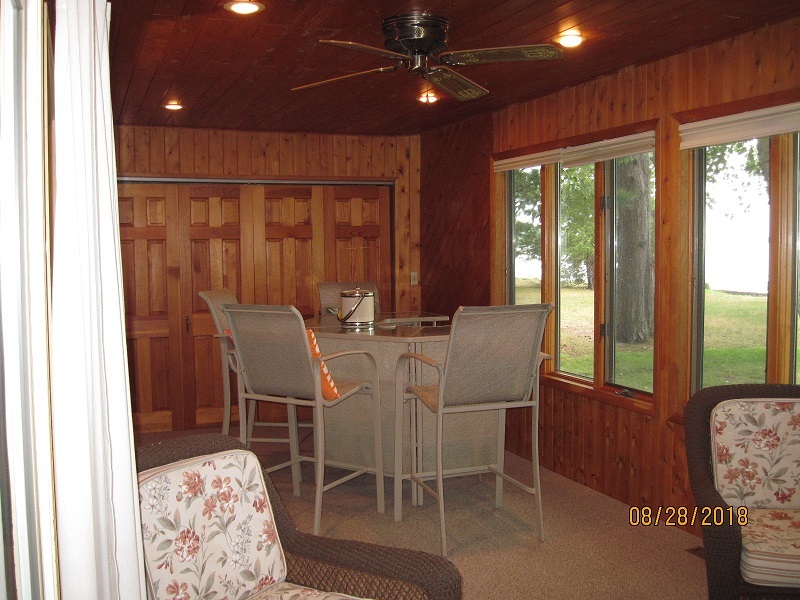 Each cottage has a screened-in porch with picnic table. The clean, sandy beach is perfect for children. 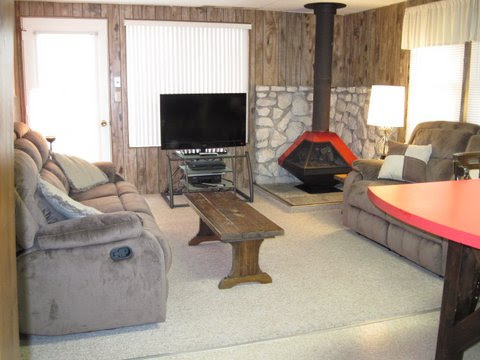 The campfire area is open to all renters. 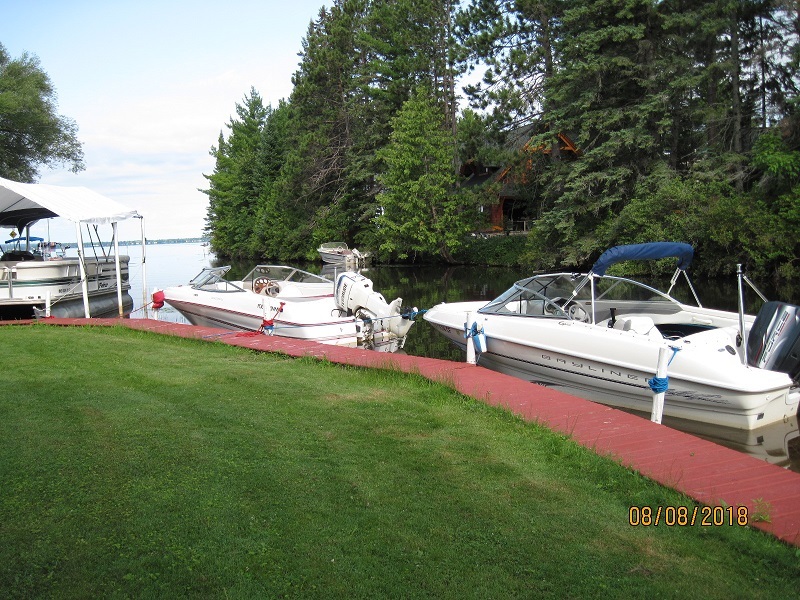 A 14’ aluminum fishing boat is supplied with each cottage. 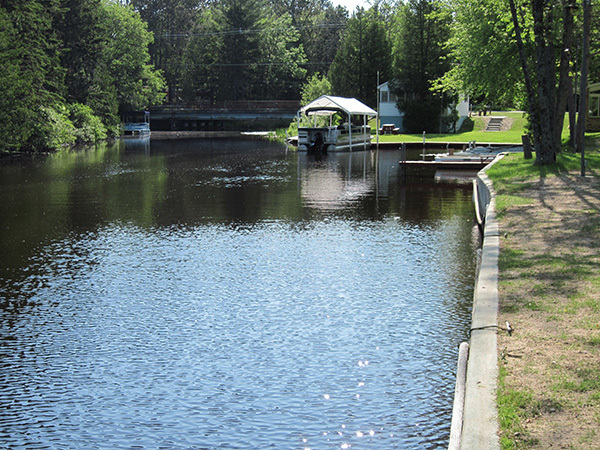 Guests are also welcome to bring an outboard motor (up to 10 HP) to put on the provided boat. Check in on August 24th and stay until September 2nd at our regular weekly rate. Reservations will be taken on a first come, first served basis so don’t wait! 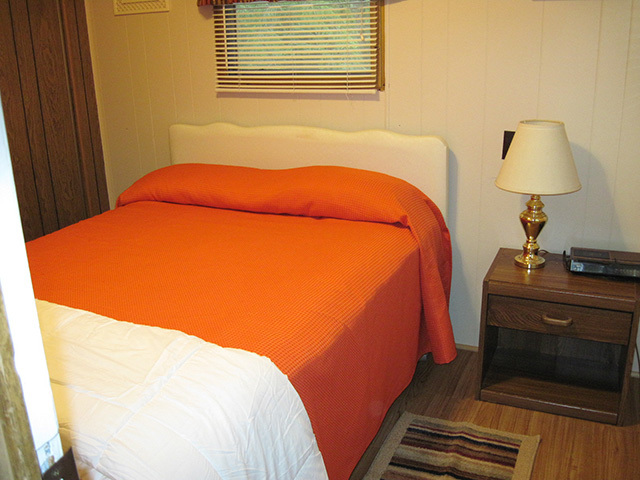 Guests must furnish bed sheets (full size) and towels. Pillows, blankets, spreads and mattress pads are provided. Check-in time is 2 PM, and check-out time is 9 AM. Smoking is not allowed in any of the rental units. 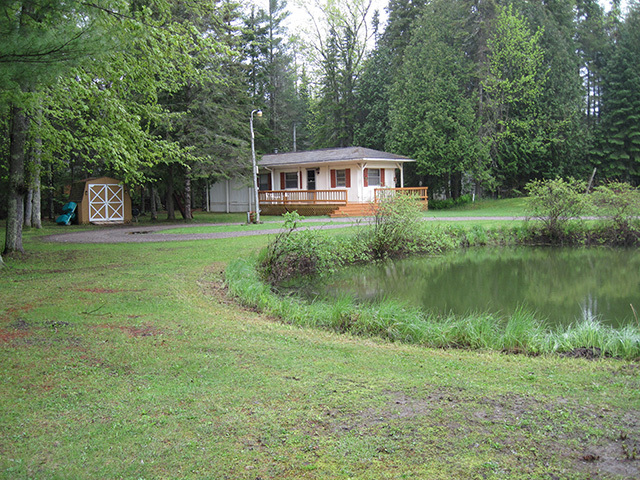 Bob and Lynn have been your hosts at Schell's Resort for nearly 50 years. 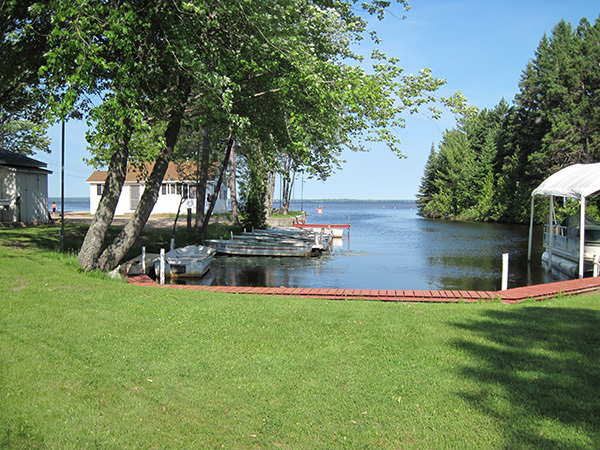 Their continued commitment to ensuring their guests' stay is enjoyable and relaxing is why some families are in their 3rd and 4th generation of vacationing at Black Lake. 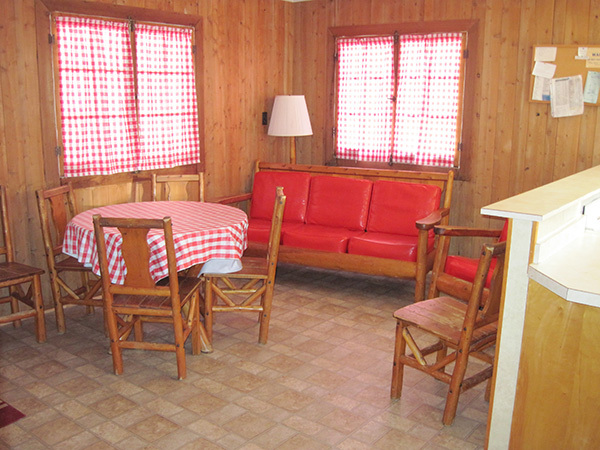 The cottages are well furnished and insure a comfortable stay by creating a "home-away-from-home" environment. Plenty of room for boats. 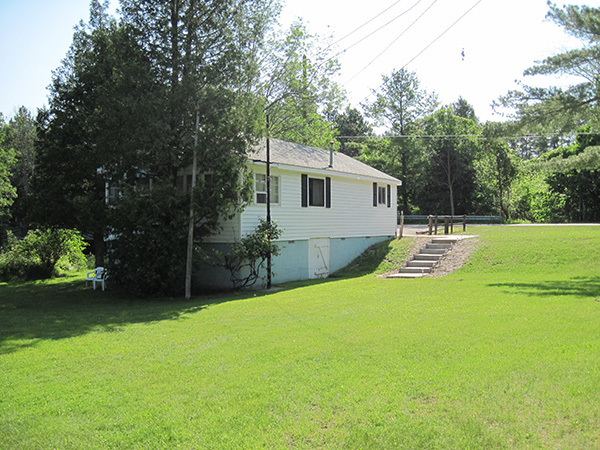 #8 is located across the street from our lake front location and sits on its own private river frontage and boat dock. 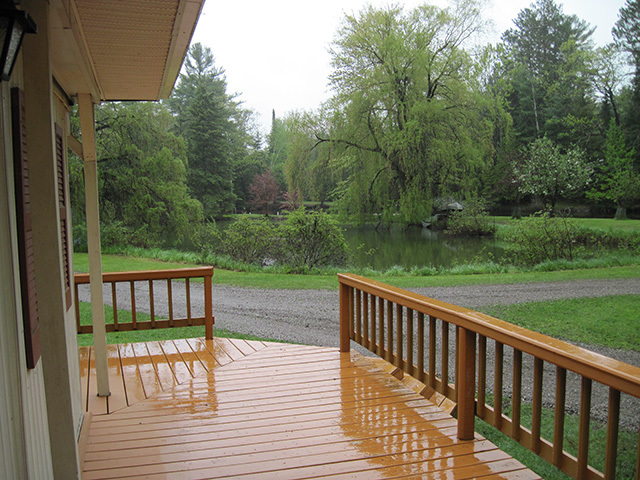 Enjoy an early morning cup of coffee on the rear deck as you enjoy the view of Rainy River and your private pond. 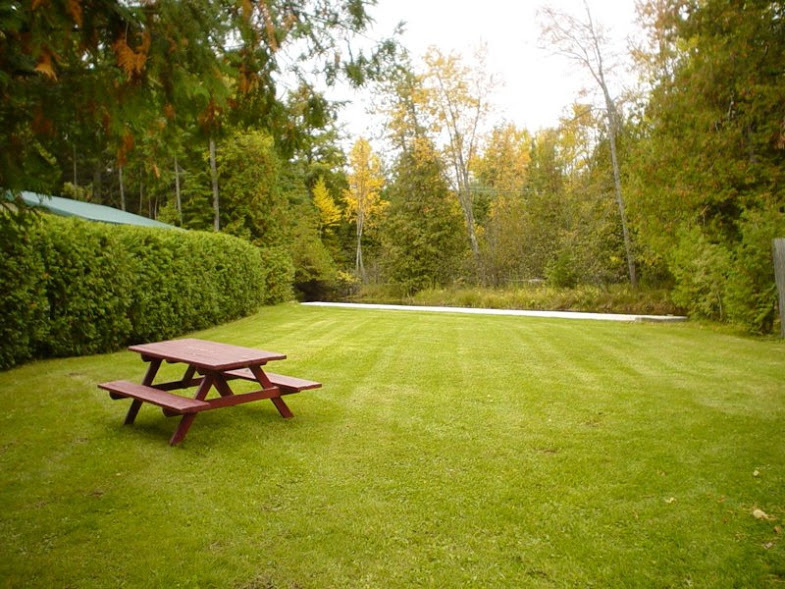 The scenic private yard is located on the Rainy River. There is concrete seawall with room to dock a boat. 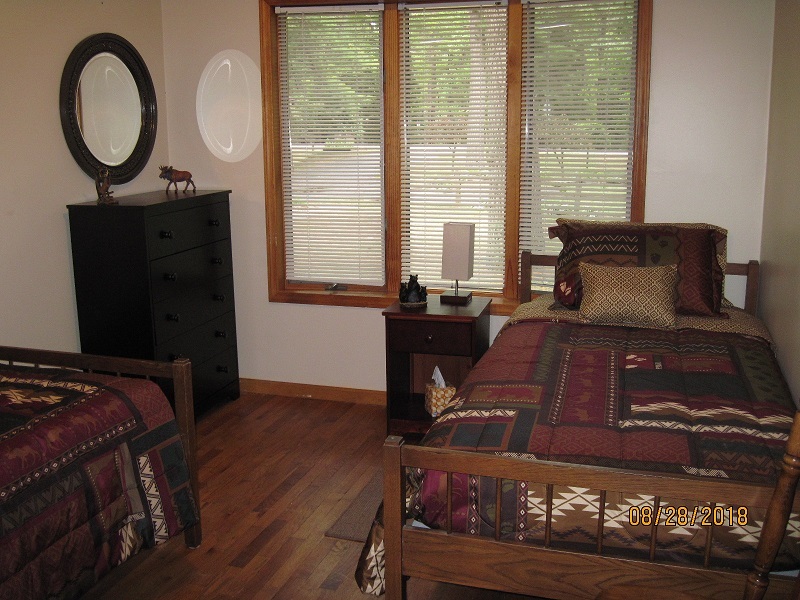 The downstairs bedroom features a queen size bed and plenty of closet space. 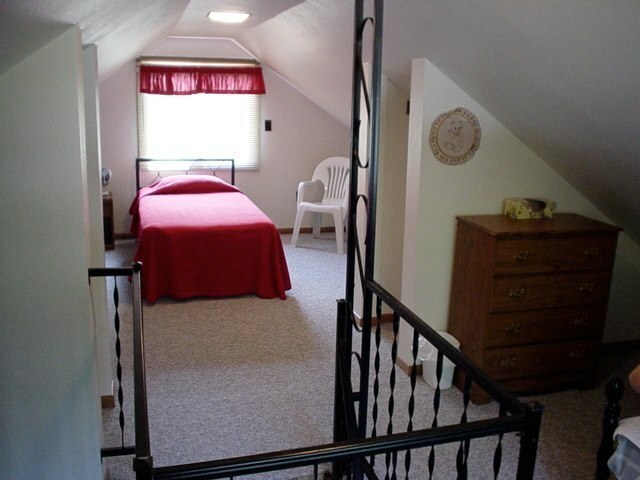 The unique stairway leads up to the full length bedroom with a single size bed on each end. Each sleeping area has its own closet space and dresser. 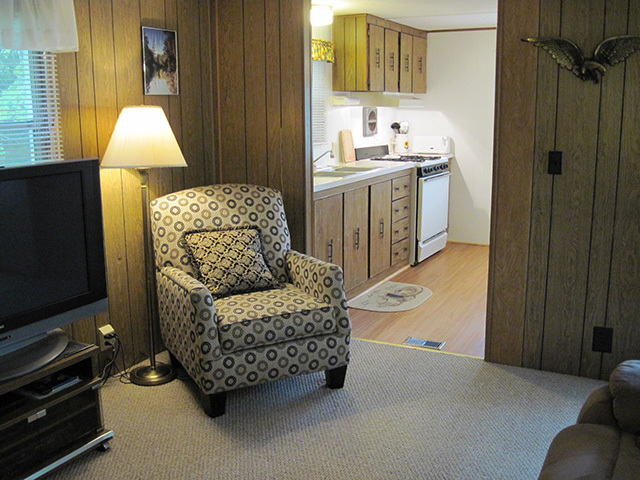 The comfortable accommodations include satellite TV, central Heat and Air conditioning, and very quiet atmosphere. A well-equipped kitchen includes a microwave, coffeemaker and crock pot. A full set of dishes, silverware, and a variety of cooking utensils are provided. 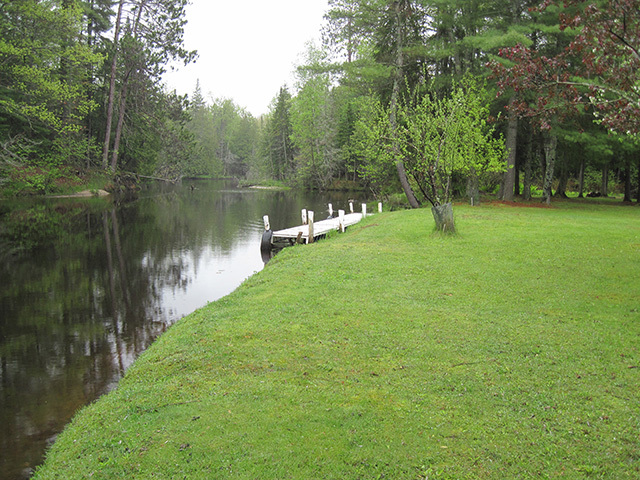 Enjoy the pristine and quiet atmosphere of hundreds of feet of your own private Rainy River frontage. 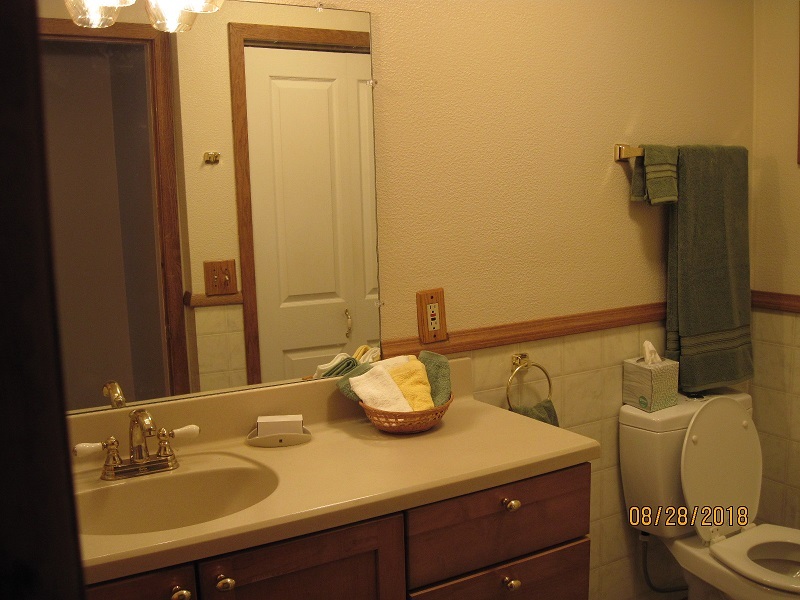 This is an uncommon benefit for a rental property. 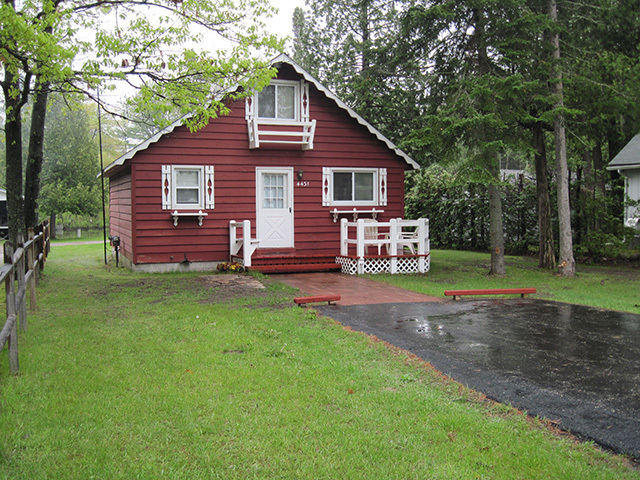 This unit has private docking along Rainy River. 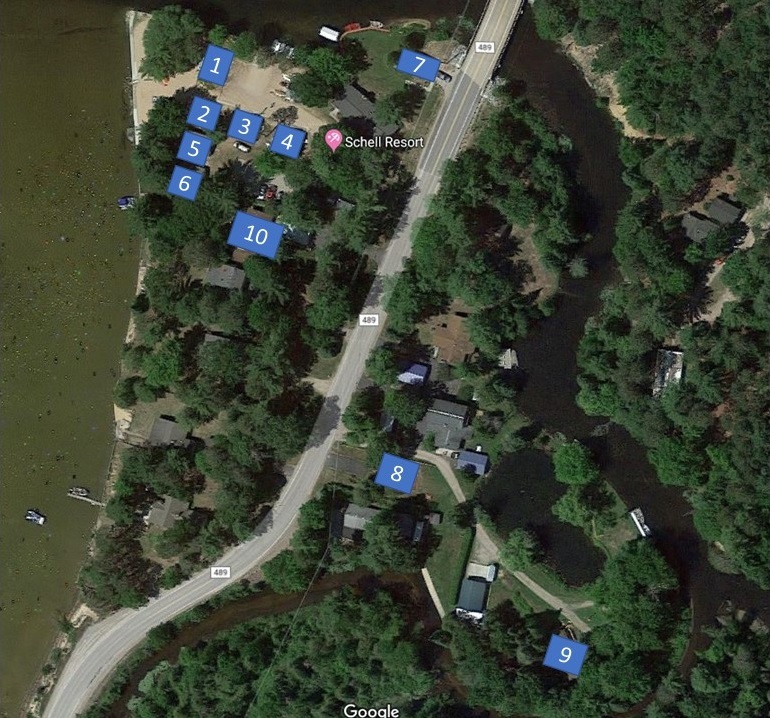 Guests that bring their own boat also have access to our private boat launch at our lake front location just a few hundred feet away. Guests enjoy watching the beautiful sunrises from the large deck of this private hide-a-way. 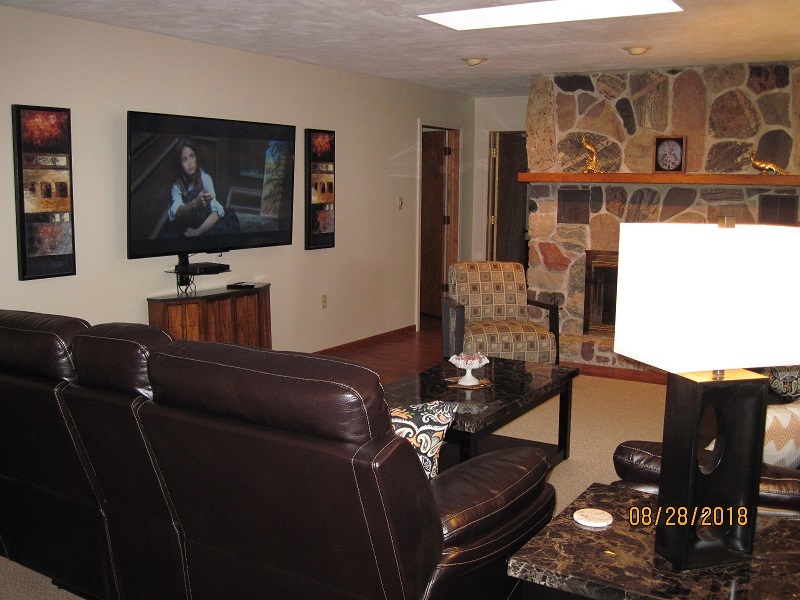 This comfortable living room equipped with satellite TV is perfect for the days when the weather isn't cooperating. 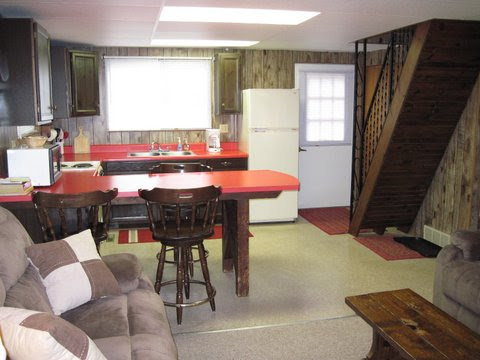 The kitchen includes microwave, coffee pot, and full set of dishes, silverware, and cooking utensils. 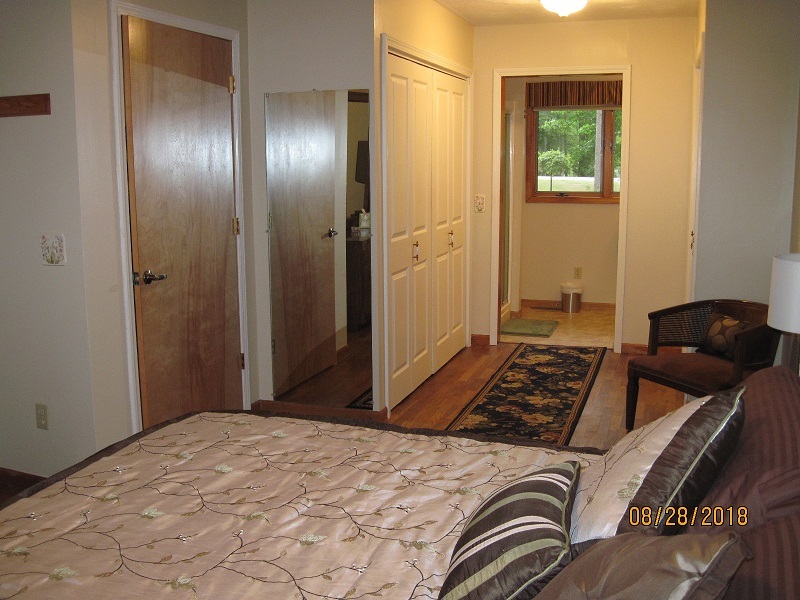 This unit features 2 bedrooms, each with a full size bed. 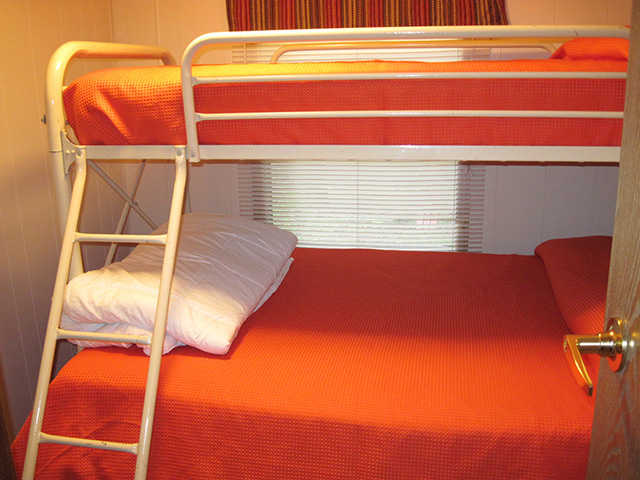 Bunk beds in the second bedroom. 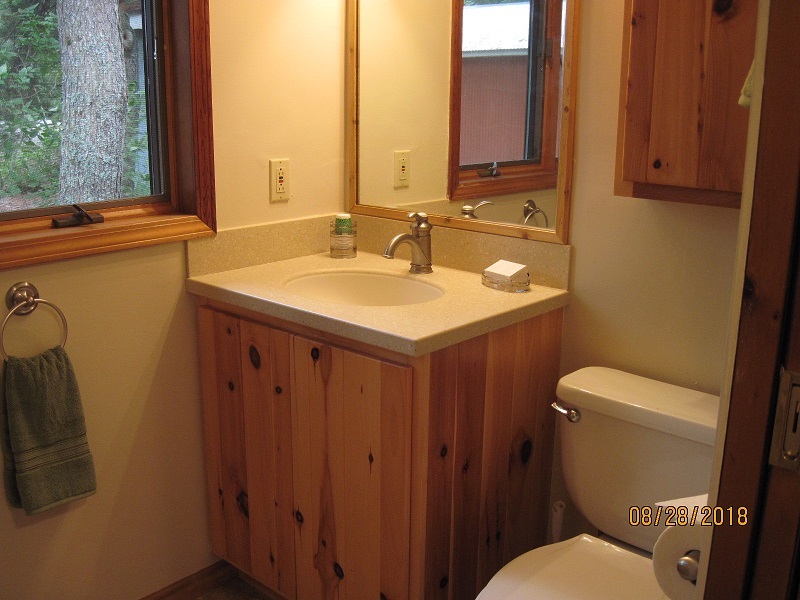 The recently remodeled bathroom includes a washing machine. A NEW LUXURY DESTINATION FOR A RELAXING FAMILY VACATION AT ONE OF NORTHERN MICHIGAN’S FAVORITE GETAWAY LOCATION FOR ALMOST 50 YEARS. 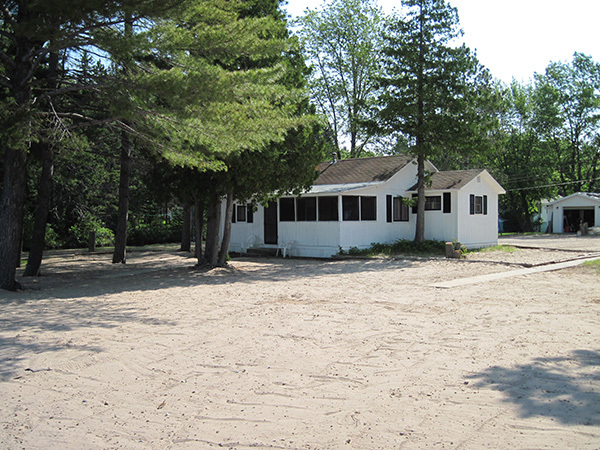 Schell’s Resort is pleased to announce the addition of another rental unit to complement our other very popular cottages on beautiful Black Lake. 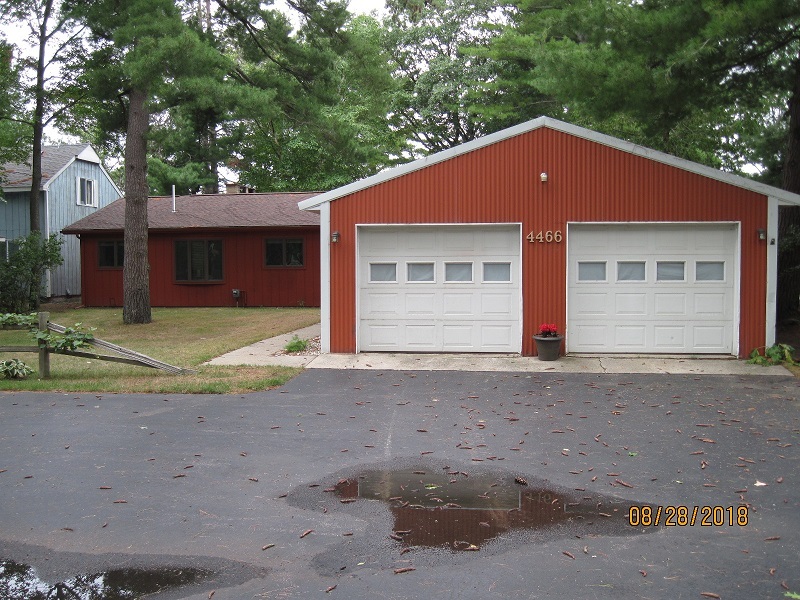 Rental rate for this home is $1,200. per week with a 1 week minimum. A $400. deposit per week is required to reserve. Normal rental periods from Memorial Day thru Labor Day is Friday to Friday, with check-in at 2pm and check-out at 9am. Flexible rental periods are available the remainder of the year with a 1 week minimum. Guests of this home also have full use of our beach facilities and boat dockage along our river frontage. For your ultimate enjoyment of this luxury home, maximum occupancy is limited to 6 people. 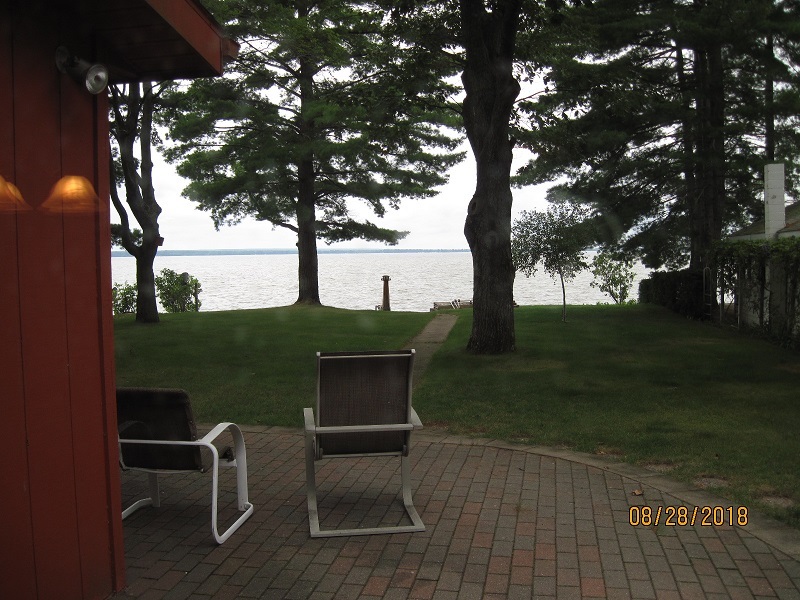 Our newest rental is a luxurious 3-bedroom, 2 and ½ bath home on it’s own private lake front lot right next door to our other cottages. 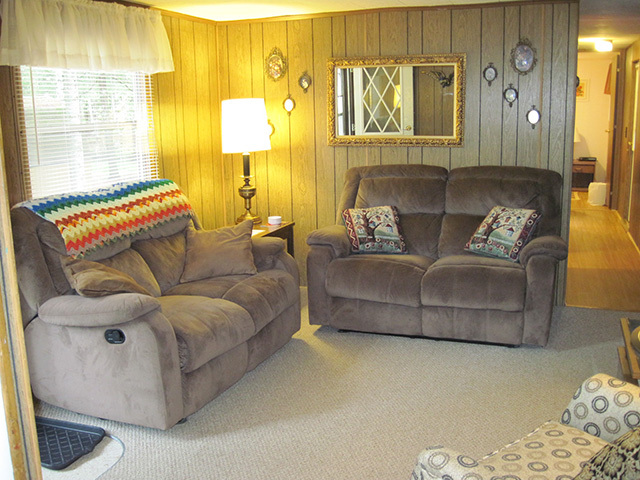 The home has forced air heat and central air conditioning. 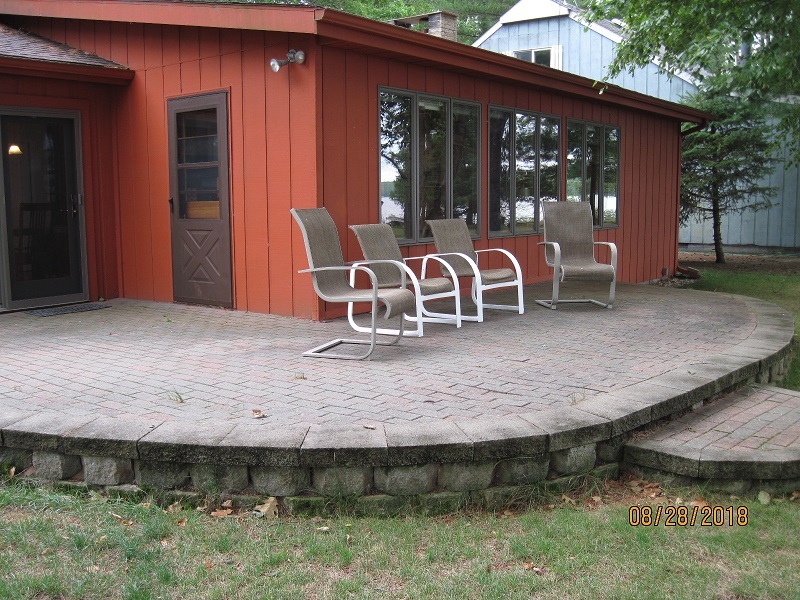 It has a glassed-in sun-room and a raised brick patio overlooking the lake. 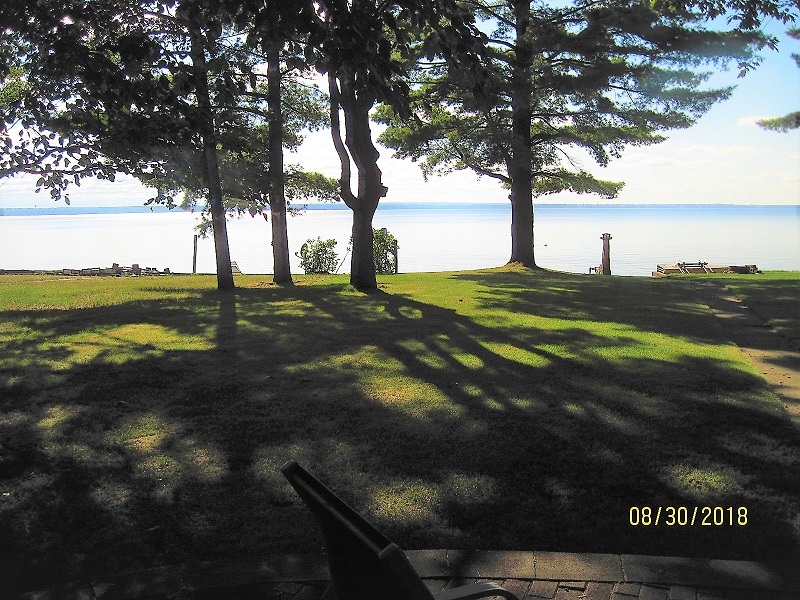 View of the lake from the patio. 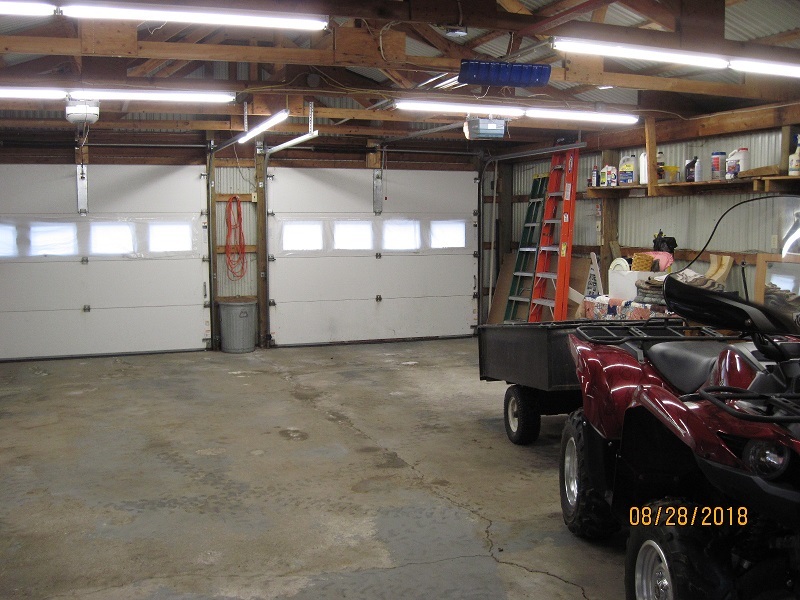 A detached 2 car garage/workshop is also available for your use. 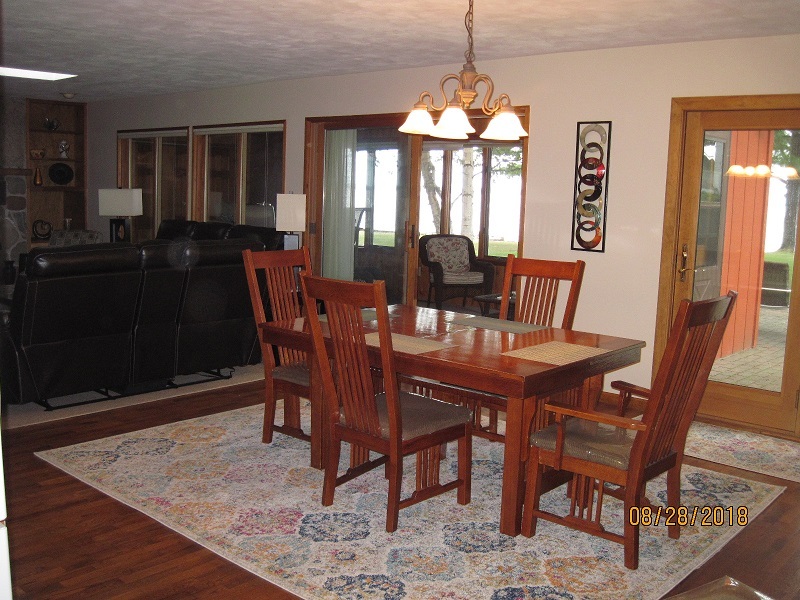 This home has been completely renovated and tastefully decorated with all new furnishings. 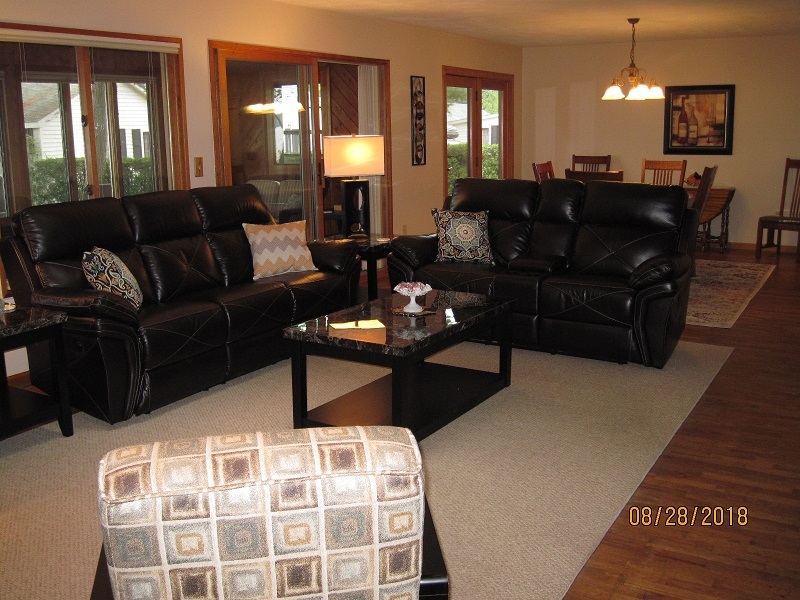 The living room is furnished with leather reclining sofa and matching reclining loveseat and two comfortable swivel chairs. 70” Smart TV with Directv package including sports pack and Starz movie package. 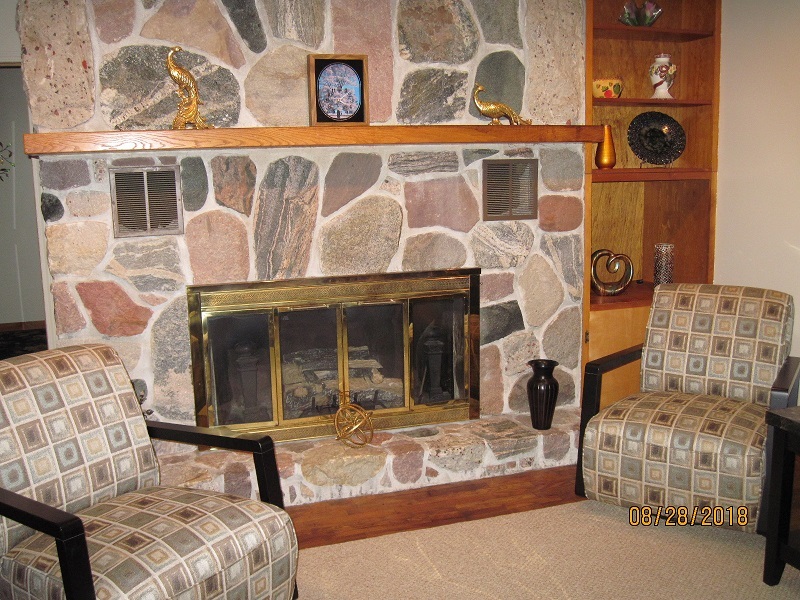 Beautiful stone fireplace with gas logs. 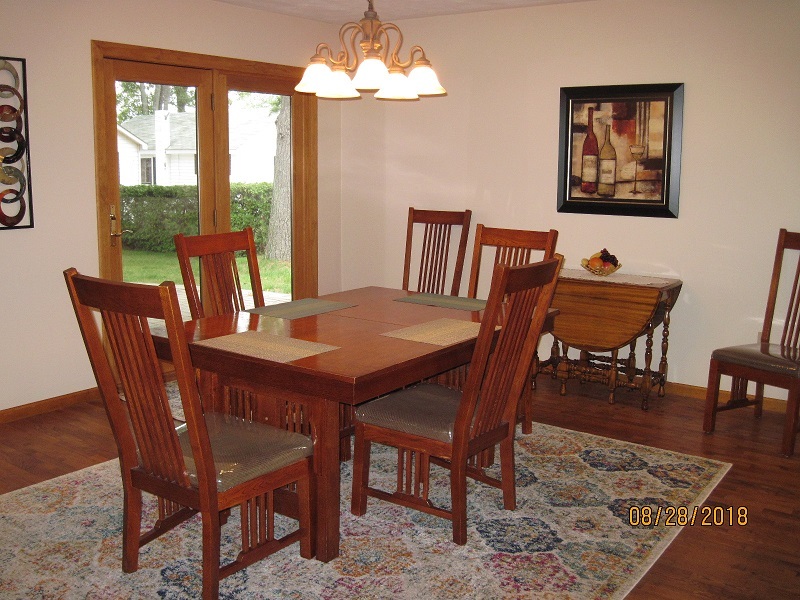 Dining area features a beautiful oak dining table with six cushioned chairs and a wonderful view of the lake. 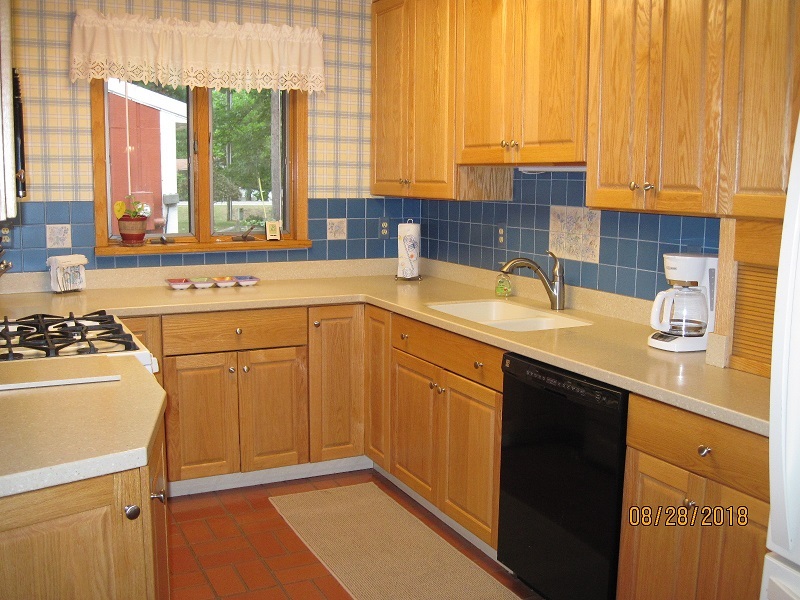 The kitchen is completely furnished, including an assortment of pots, pans, utensils, dishes and silverware. 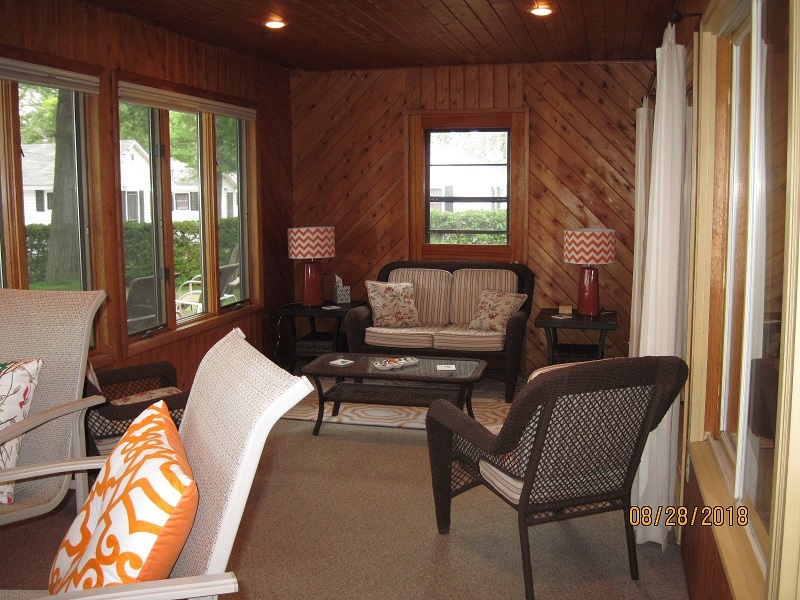 The sun-room is furnished with a glass-top bar with raised stools. 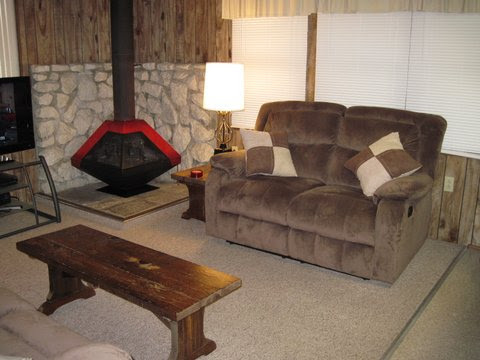 There is also a love-seat and armchairs that provide a comfortable place to read a book or just gaze at the lake. Master bedroom with a king-size bed. Home also includes all linens except beach towels. 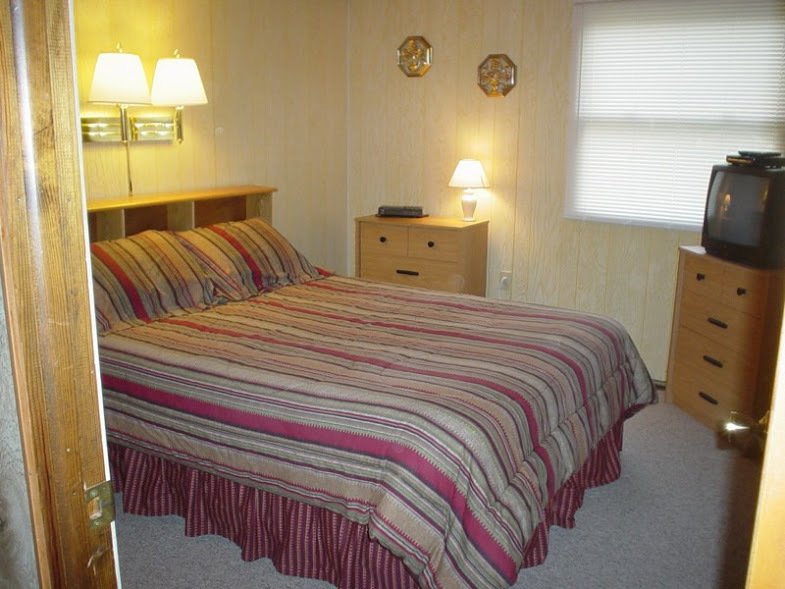 Blankets, pillows, blankets, comforters and mattress pads are supplied for each bedroom. 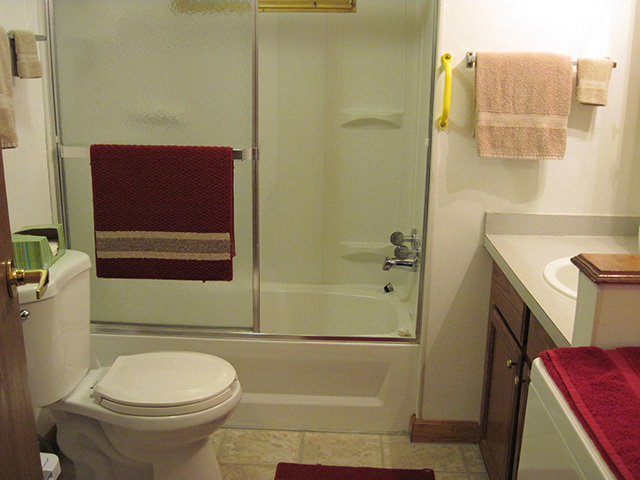 The main bath has a tub with shower. A hair drier is provided. 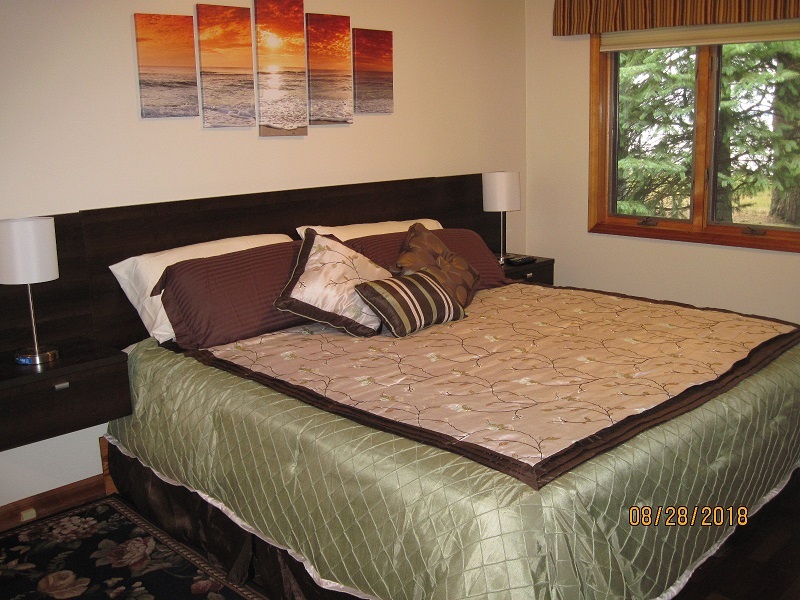 The second bedroom features a queen size bed. 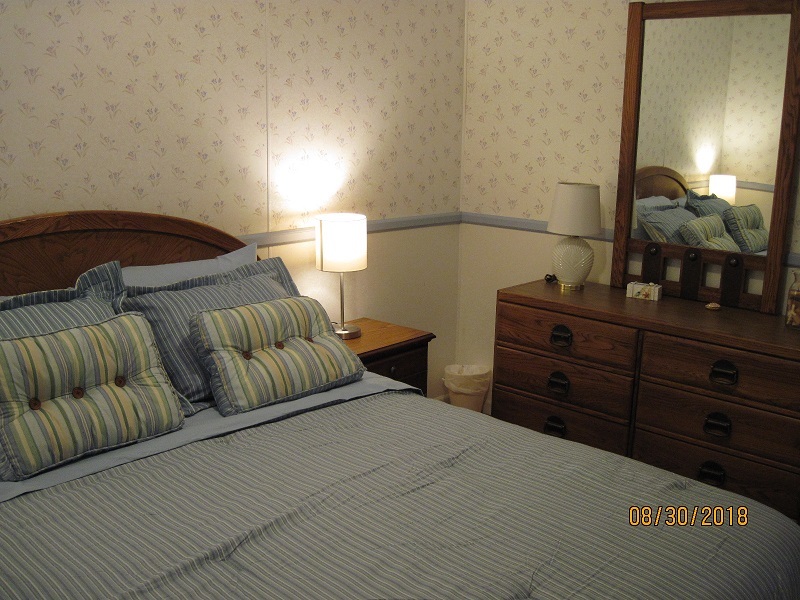 The third bedroom has twin beds with an “up north” theme. 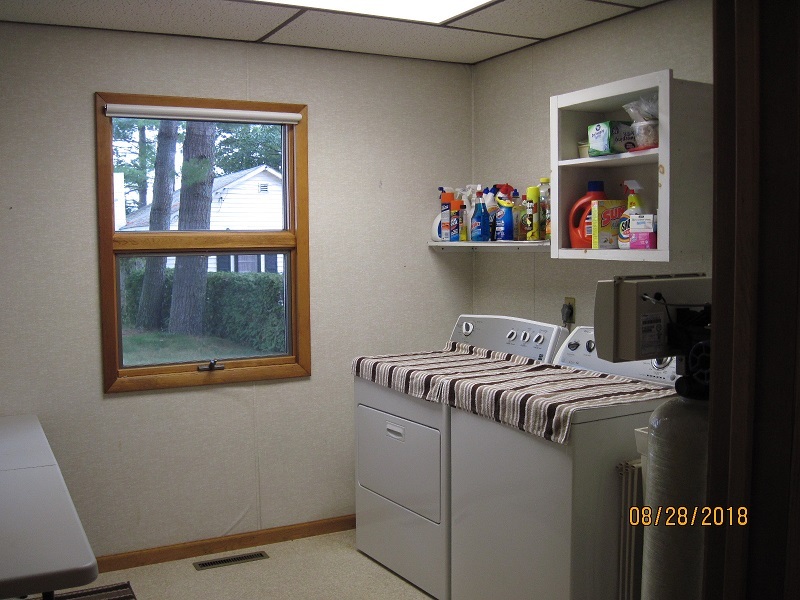 Utility room has a washer and dryer and is next to the half bath near the rear entrance. There are also two single-person kayaks available for your use.